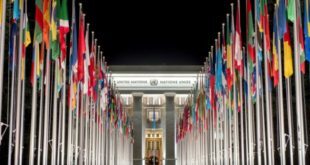 PARIS, 15th June 2018 (IBIB) – The U.S. 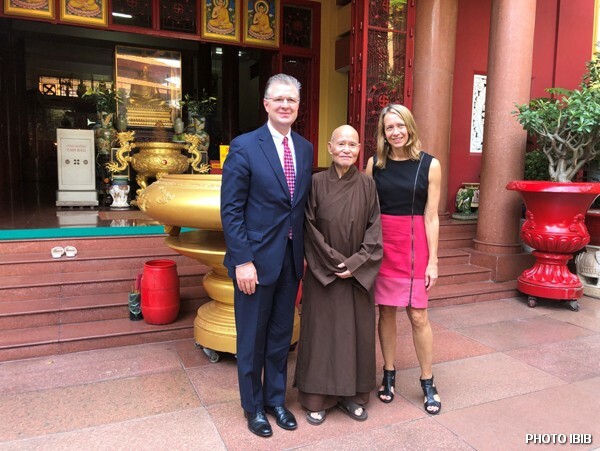 Ambassador to Vietnam Daniel J. Kritenbrink visited Buddhist dissident Thích Quảng Độ, Patriarch of the Unified Buddhist Church of Vietnam (UBCV) at the Thanh Minh Zen Monastery in Ho Chi Minh City (Saigon) where the UBCV Patriarch is under house arrest. 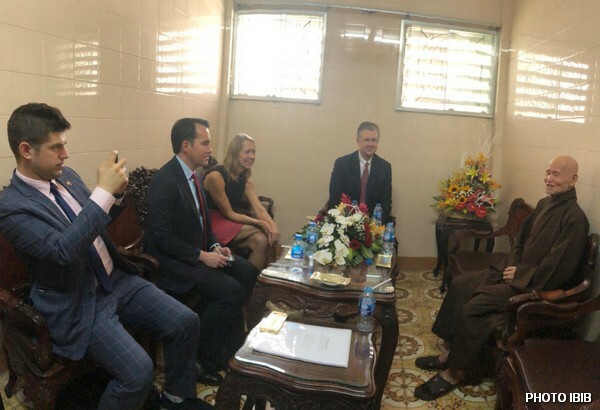 The Ambassador was accompanied by US Consul General Ms. Mary Tarnowka, Justin Brown, Political Officer at the US Consulate in Ho Chi Minh City and two members of staff. This is the first visit by the US Ambassador, who took up his post in Hanoi in November 2017. The meeting took place on Thursday 14th June at 10:00am and lasted for over an hour. Thích Quảng Độ told IBIB Director Võ Văn Ái that the meeting was very friendly and cordial. He handed the delegation a 12-page Memorandum detailing the government’s systematic repression of the UBCV over the past 43 years, and an overview of his main concerns, including religious freedom, Vietnam-China relations, the recent Cybersecurity Law, human rights and democratization in Vietnam. His detention under house arrest, he wrote, was part of an overall policy to stifle all criticism and dissent: “The government’s aim in detaining me here is to silence my voice. Just as the Police have used violence and brute force over the past few days to silence the voices of citizens demonstrating all over the country to protest the adoption of new laws that would sell out our national interests and curb our rights to free expression”. 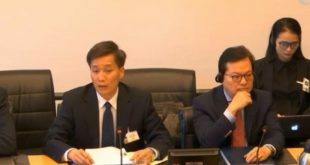 He observed that the recent widespread protests in Vietnam reflected deep popular discontent about the draft law debated in the National Assembly on special economic zones (SEZs) that would allow land to be leased to foreign investors for a 99-year periods. 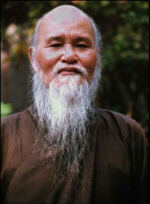 “We Vietnamese know the ambitions of our northern neighbour, for Vietnam was China’s vassal for 1,000 years. The demonstrations that broke out this week-end were a spontaneous reaction to the Communist Party’s concession of our resources and lands”. “Although I am confined in my Monastery”, he wrote, “I feel very close to the people who have taken to the streets and risked their liberty to defend their ideals. Their protests are a warning call to our government – a call to defend our sovereignty and protect our homeland, but also a call for pluralism, democracy and human rights”. 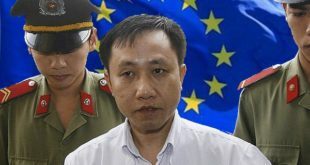 Thích Quảng Độ denounced the Cybersecurity Law adopted by the National Assembly this week that “seriously violates freedom of expression online” and “gives Hanoi new tools to censor the Internet, imprison critics and stifle dissent”. He informed the US Ambassador that since 1975, when the Communist Party took power in Vietnam, the UBCV had consistently maintained that there could be no development or progress in Vietnam without democracy and human rights. “In my numerous appeals to the Vietnamese government and the Communist Party, I have always insisted that we cannot defend our country if we are denied the right to participate equally in our nation’s affairs”. “Even religious freedom cannot exist without democracy and human rights. Under the government’s new Law on Belief and Religion, we have a minimal freedom of worship, but true freedom of religion or belief remains taboo”. Thích Quảng Độ urged the US Ambassador to ensure that religious freedom and human rights remained a high priority in the United States’ relationship with Vietnam, and called upon him to seek every opportunity, both in public and private, “to press Vietnam to cease repression against the UBCV and all other non-recognized religious communities; to re-establish the legitimate status of the UBCV and allow us full freedom to exercise our religious activities in peace”. 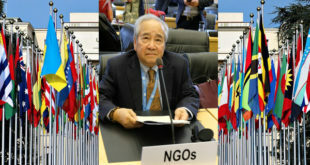 guarantee the fundamental rights to freedom of conscience, expression, assembly and association as guaranteed in the United Nations’ International Covenant on Civil and Political Rights, to which Vietnam is a State Party.